examples abound in machine transwlations of Chinese. Just check any TCM website and hit google translate for laughs. Found one the other day which suggests eating people as a treatment………. Can anyone please translate this into correct English? For the last three characters, Google m/c xlation is "good down." @Tom Davidson, that example is really interesting, since if you tell Google translate to parse it as Japanese, it comes back with "Beef Knee Good Low Line", despite the fact that 牛膝, 性善, and 下行 are words that would more or less match the translation it gives for Chinese, "Achyranthes good down". @S Frankel – no doubt soon to be translated by Bing as "Ich bin ein Berliner"
Reminds me of how I recently discovered that Google Translate has begun rendering 我國 ("our country") as "China." Can't blame that one on BING. @Ninetto: No, that is an urban legend. “Ich bin ein Berliner” is perfectly fine in German. @Ninetto – what Vilinthril said. "Ich bin Berliner" would mean he actually came from Berlin rather than he was, so to speak, one with them. Why keep harping on machine translation when human translation is already poor? A high-ranking lieutenant, he was allegedly part of a plot to stage a gun attack and make it look like the work of Islamic militants. What is a "high-ranking lieutenant" supposed to be? This isn't figurative. Apparently somebody without understanding of military ranks had to translate German Oberleutnant, i.e., first lieutenant. @Christian Weisgerber: I see no error in the BBC translation. "First lieutenant" is jargon; unless you have learned the rank-order for the appropriate military service you are left wondering whether it is higher or lower than, say, "third lieutenant". "High-ranking lieutenant" explains it nicely. To go back to the Macron tweet: at least the Bing translation is immediately detectable as a mistake and, in any environment where there is a human editor that goes through the translation before it's published, it would be immedidately corrected. Also: it's funny. 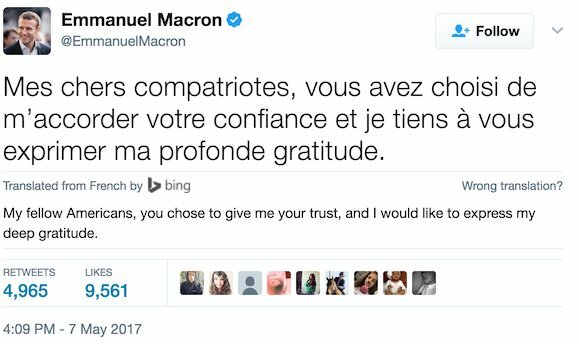 It's easy to see how the Bing error happened: "Mes chers compatriotes" is an excellent translation of "My fellow Americans", just not the reverse. But am curious how Google got its result. I increasingly see 'compatriot' used to mean 'comrade' or 'companion'. Dictionaries seem still to think that it means 'fellow-citizen', as the French word clearly does, but I wonder how long this will continue. La France est la deuxième patrie de tout le monde, n'est pas? Vilinthril and S Frankel are correct. This is indeed a myth. While I agree with you that the terminology of military ranks is a jargon that one shouldn't assume to be transparent to the general public (particularly the general public in a country like the UK where compulsory military service disappeared long before it did in most of continental Europe), I don't think that "high-ranking lieutenant" does the job of making things easier to understand. Firstly, "high-ranking lieutenant" is pretty much a contradiction in terms; a first lieutenant is still a very junior officer. The use of "high-ranking" could give the impression that this plot involved more senior people than it actually did (which is not to minimise the problem of far-right infiltration in the Bundeswehr), particularly if the reader is ignorant of the jargon of military ranks. Secondly, "first" would, I think, be assumed by most people to be senior to "third". Nicola Sturgeon is the First Minister of Scotland. A first-class honours degree is better than a third-class honours degree, etc. Interestingly (and sorry for staying OT), Deutsche Welle's English-language website is also using the term "high-ranking lieutenant". I wonder where it started…. @Andrew – maybe partly due to a mishearing or association with 'compadre'? My Oxford thesaurus lists 'compatriot' under 'companion', but not vice versa. The problem with “a high-ranking lieutenant” is that it’s unclear. It could mean that the accomplice was high in the plot leader’s ranks of associates, or that he was the plot leader’s aide who held high rank in the community or elsewhere, or that he held some military rank of super-duper-lieutenant, or that persons of the military rank of lieutenant are thereby high-ranking. The fact that the plot was within the army suggests one or the other of the two last, faintly ridiculous readings. "High-ranking lieutenant" makes me think of some important guy in some crime organization. I'm probably showing my age and nationality when I wonder why "first lieutenant" is considered unfamiliar. Reminds me of FB translating the Hebrew "חַג שָׂמֵחַ" (happy holiday) as Merry Christmas, much to the distress of Jewish FBers – even though both Google and Bing got it right. And rather than correct it, they decide to just refuse to translate it any more.